Paul Bouman at Grace Lutheran Church in River Forest, Ill. Photo by Alex Garcia ’89. Barbara Brotman is a former columnist at the Chicago Tribune and a singer with the Oak Park Concert Chorale, which regularly performs works by both Bouman and Wolniakowski. Musician Paul Bouman’s compositions have found a new audience thanks to his friendship with composer, independent publisher and fellow alumnus Michael Wolniakowski. Paul Bouman is an elder statesman of Lutheran music. Music director at Grace Lutheran Church in River Forest, Ill., for 30 years before he retired, the 99-year-old Bouman ’51 MMus has been composing for more than 50 years. His work has been performed by choirs and in churches around the country. But a partnership with a composer more than five decades his junior has brought new attention to Bouman’s work. Michael Wolniakowski ’02 MMus, a composer, vocal coach, organist, pianist and veteran choir director, has long been among Bouman’s admirers. But lately he has become more: protégé, publisher and friend. Their connection began with a dream — Wolniakowski’s. Wolniakowski, 42, is a highly regarded musician in the close-knit community of singers, organists and composers who have come out of Concordia University Chicago, the Lutheran college in River Forest, Ill., where Wolniakowski earned his undergraduate degree. 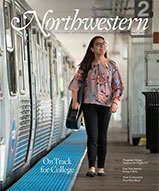 A number of those Concordia musicians, like Wolniakowski and Bouman, got their graduate degrees at Northwestern. Wolniakowski spent 13 years as a teacher and choir director at west suburban Lyons Township High School, until the dream arose in the form of a life-changing question: Should he quit to become a composer full time? He loved composing, which speaks to both his creative impulses and his community-building nature. “Bringing people together and having your music be the thread that runs through everyone — that’s something special,” he says. His works had already been well received. “He is a very, very gifted composer,” says Northwestern professor emeritus Robert A. Harris, with whom Wolniakowski studied composition and conducting. “He has a good understanding of how to set words to music. … I’ve used his pieces on several occasions and found them to be very meaningful.” Harris is music director and choirmaster at Winnetka Congregational Church. Wolniakowski had been thrilled to spend a year composing at the Royal College of Music in London, where he completed a postgraduate degree on sabbatical from Lyons Township. The experience made him want to devote more time to composing. He knew that trying to make a life as a composer and music publisher would be a risky challenge. But he felt himself at a crossroads. If he was ever going to pursue his dream, he had to jump into the unknown. He jumped. In 2009 he left Lyons Township and set about turning his dream into reality. And for guidance, he had an idea where to turn. 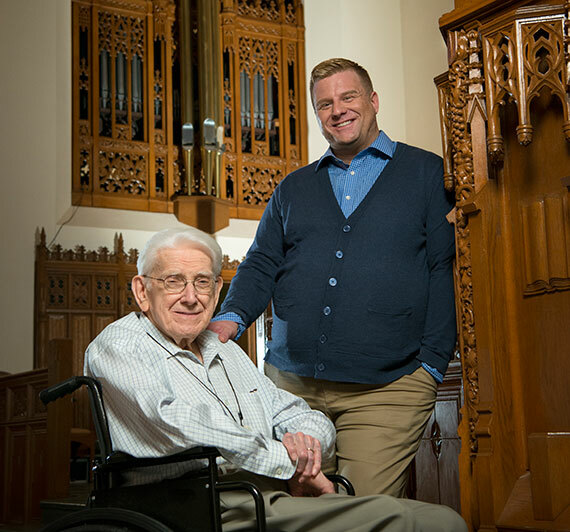 He had gotten to know Bouman at St. Luke Ministries, a Chicago church where Wolniakowski worked as assistant to the late composer and organist Paul Manz ’52 MMus and where Bouman sometimes played organ. As Wolniakowski embarked on his new life, which included founding a music publishing company that he called Tempo 1° Press, he took to asking Bouman’s advice. The two became friends. Paul Bouman, left, and Michael Wolniakowski at Grace Lutheran Church in River Forest, Ill. Photo by Alex Garcia ’89. During their visits Wolniakowski learned much about how Bouman worked and the attention he paid to detail. He also learned that Bouman had a lot of works that had never been published. Wolniakowski resolved to put them in print himself. His publishing company’s first project was a 64-page book of Bouman’s church anthems, published in 2014. It included never-published older works and new ones. The book was a capstone to Bouman’s life’s work — a career that can be traced back to rural Hamburg, Minn.
Bouman grew up the youngest of 10 children. His father was a Lutheran pastor, and both his parents sang at home — very well. “My father liked to sing German lieder, folk songs. My mother sang while she cooked,” Bouman says. Bouman sang at home and in church. He learned to play the organ by watching the church’s organist. He immersed himself in music by going to Concordia, then became a music director and teacher at a Lutheran school in Milwaukee; at St. Paul Lutheran Church’s school in Melrose Park, Ill.; and finally at Grace Lutheran. It was while working on a master’s degree in music at Northwestern that Bouman got his first taste of having his work performed. A piece that he wrote for an assignment — to write an aria in the style of Handel — ended up being recorded by the renowned American Boychoir. He could and did. The American Boychoir also recorded his “I Lift Up My Eyes to the Hills” and performed it on tour and at a UNICEF memorial service for Audrey Hepburn. Having deepened his appreciation of J.S. Bach’s sacred cantatas at Northwestern, Bouman co-founded the Bach Cantata Vespers (with Carl Schalk, also a noted choral director and composer) at Grace Lutheran Church. The group presents monthly performances in a worship setting, as Bach intended. The Bach Cantata Vespers just finished its 46th season, the longest such series in the Midwest. Bouman also created a children’s choir at Grace Lutheran that regularly won state competitions. The choir’s sound was so lovely that musicians from Northwestern would go to Grace Lutheran to listen and ask how Bouman got them to produce it (one answer: He taught them to pronounce vowels with the kind of coloration used by the famed Choir of King’s College, Cambridge). For Wolniakowski, the visits with Bouman are a precious opportunity to learn from a music master. But Bouman says that he, too, has been learning — about the English style of composing choral music that Wolniakowski studied at the Royal College of Music in London, and modern techniques like clashing sounds and nontraditional time signatures. Karen Brunssen, co-chair of music performance at Northwestern and a friend of both men, is delighted at their musical partnership. Wolniakowski is busily pursuing his dream. He is composer-in-residence at the Oak Park Concert Chorale and at a Lutheran school in Kansas City, Mo. Wolniakowski’s choral works have been performed by Chicago Choral Artists, Acappellago, the Heritage Chorale and Northwestern choral groups. One of his pieces was performed this year at the London Festival of Contemporary Church Music — one of only 30 pieces played out of 130 submissions from around the world. Bouman, who retired from Grace Lutheran in 1983, continued to write prolifically until very recently. Now arthritis makes it difficult for him to play piano, where he works out compositions. His wife of 70 years, Victoria, died five years ago, but his five children and music friends are frequent visitors. Wolniakowski is one of them. The reality of a friendship with a musician nearing 100 means that sometimes they talk about music for a specific, inevitable event. Bouman is cheerful company, and, with his flowing white hair, cuts a dapper figure at the concerts he still frequents, using a wheelchair in deference to a knee injury. And when asked, he gladly reflects on his life’s work.